First, before anything else, I want to say thank you for the kind words posted today on Allie Jane's birthday. I read and loved every comment and email sent to me today. Some from people that I've never even met. I feel your love. It's been a good day. We are truly blessed to know that we will be united again with our sweet daughter. I have no doubt that Heavenly Father is caring for her until I can get there. She's in the best hands! I have been SOOO excited to tell you... I wanted to wait until I hit 2,000 followers- but I say we're close enough!! 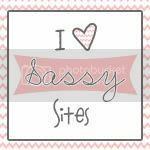 ;) I just want to say THANK YOU to all of my loyal followers of Sassy Sites!! It's because of you that I blog everyday, I stay up until 2am sometimes finishing a post, I hurry home from vacation to catch up on my blog, I get excited for Tuesdays because of t2t, and I can't wait for Fridays for our ffa party! I love blogging because of YOU! In celebration of reaching our 2,000 follower mark, we are going to be giving away GREAT prizes from seven of my most favorite bloggers! Grab a button so everyone can join the fun!! You don't want to miss this! Be sure to check back every day to see what's coming up next. Join us tomorrow morning for our FIRST giveaway! And by the way, the "entry rules" for each giveaway are easy peasy!! I'm so glad you got such great support!! !